मानव रक्त में प्लास्मोडियम फैल्सीपैरम वलय-रूप तथा युग्मक. ↑ "मलेरिया के लिए करोड़ों डॉलर". बीबीसी. अभिगमन तिथि ३१ अक्टूबर २००८. ↑ "एचआईवी-एड्स और मलेरिया में संबंध". बीबीसी. अभिगमन तिथि ३१ अक्टूबर २००८. ↑ Roll Back Malaria. "Economic costs of malaria". WHO. अभिगमन तिथि 21 सितंबर 2006. ↑ "मलेरिया से लड़ने के लिए आगे आए दानकर्ता". हिन्दी नेस्ट. अभिगमन तिथि ३१ अक्टूबर २००८. ↑ Malaria life cycle & pathogenesis. Malaria in Armenia. Accessed October 31, 2006. ↑ Escalante A, Ayala F (1994). "Phylogeny of the malarial genus Plasmodium, derived from rRNA gene sequences". Proc Natl Acad Sci U S A. 91 (24): 11373–7. PMID 7972067. डीओआइ:10.1073/pnas.91.24.11373. ↑ Cogswell F (1992). "The hypnozoite and relapse in primate malaria". Clin Microbiol Rev. 5 (1): 26–35. PMID 1735093. ↑ The Faculty of Homeopathy. 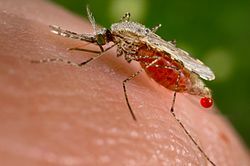 "Faculty advises against homeopathy for malaria prevention". British Homeopathic Association. DriveAgainstMalaria.org, "बच्चों के सबसे बडे़ जानलेवा के विरुद्ध विश्व की सबसे लम्बी यात्रा"